Only with prooven working malamutes! The kennel name represents our goal. Our history: Everything started when I came back home from a short job as doghandler at a sleddog safari farm in Swedish Lapland 2002 where I fell in love with the breed. 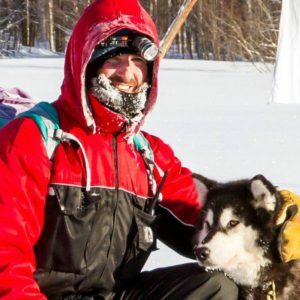 I got my 2 first malamutes in 2003, started training them and in 2004 I made a 1800 km/51 days dryland ‘expedition’ from my home city Kortijk (Belgium) to Estonia. On foot walking behind my 2 malamutes that pulled a little trailer with all my stuff. In Estonia I settled down and started breedng sleddogs and malamutes. 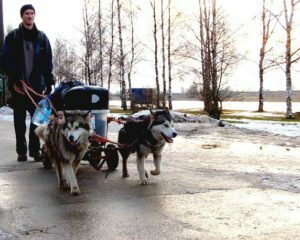 In 2007 I established my own sleddog tourist safari business named Karulas wolftrail. 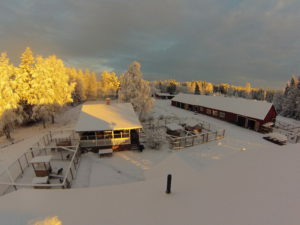 In 2011 the FCI malamute kennel got registred.Later we mooved to Swedish Lapland where we continued the tourist business as Lapland Wolftrail. Today: All dogs take part in the 3-5 day tourist tours of Laplands Wolftrail. Since 2013 the best dogs also join my long distance racing team. We have done Eastpoint open 2014 and 2015. Gold rush Run 2017 and 2018. Both 300 km races. Next to the working we also try to do some dogshows with the breeding dogs to make sure they are fitting the malamute breed standard. Though showing we are not very focused on and we don’t hunt for champion titles. Breeding: For Back to Works breeding program we are looking around the world for new bloodlines. We don’t breed giant malamutes neither very heavy types. Those types are more suitable for weight pulling or back packing. Neither we breed the overly light husky type malamutes that are more suitable for sprint racing. Neither we breed long coats. Our focus lays very much on medium sized malamutes, 58-64 cm tall and 28-38 kg in order to maximalise their function as a sleddog in todays modern dog sledding activiys, mid and long distances touring, racing and expeditions. Malamutes with a good speed (10 km/hour average in longe distance) and a powerfull trot. -We feed mainly raw food/barf. -We keep the dogs atletic without overweight. -Next to the intensive trainings and free runs the dogs live 24/7 together in groups of 3-6 dogs. Alaskan malamute are no racing dogs in terms of speed compared with Alaskan or Siberian huskys. Though joining a non-stop long distance race is a good working tests for malamutes. If they are able to finnish such 250 km + race it prooves their strenght, endurance, their working drive and the correctness of their bodystructure. To whom we sell: Of each breeding we keep one or more offspring for ourselves to further develop our lines, the others we sell preferable to other kennels that are looking for good working malamutes and to mushers, (also beginners) or at least to very active people who can give the malamute a life the malamute needs with all kinds of activitys. Our malamutes are not suitable for only-pet-homes. Theme Designed by Rohit. © 2019 Alaskan Malamute kennel Back to Work. All Rights Reserved.